Faoi dheireadh, agus cuirimid an-fháilte roimhe, tá foclóir de Bhaldraithe againn anois, ar an idirlín, agus é ar fáil saor in aisce. Is leagan leictreonach inchuardaithe é seo d’fhoclóir Béarla-Gaeilge de Bhaldraithe. 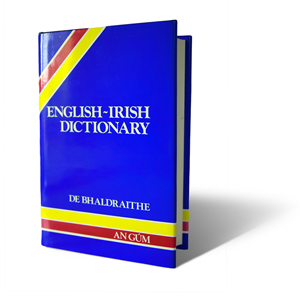 Foilsíodh an English-Irish Dictionary féin in 1959 agus foilsíodh Aguisín leis, Terminological Additions and Corrections, in 1978. Sa leagan ar líne seo tá breiseanna agus leasuithe an Aguisín curtha i bhfeidhm síos tríd an mbunfhoclóir. Seachas sin cloítear go dílis le téacs an bhunfhoclóra seachas corrbhotún cló a chur ina cheart.